Home » Listings » 116 Breeze Ave.
Beach walk street 1910 Craftsman 3 bedroom + 2 bath with original charm and detailing. 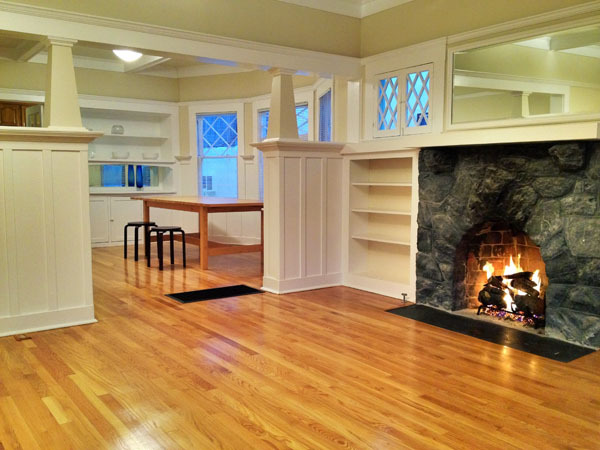 Open living room/dining room floor plan separated by pillared half-wall with built-in bookcases, gas fireplace with mantel and an abundance of windows, all of which open. Updated kitchen and bathrooms with ceramic tile and granite. New stainless steel appliances and washer/dryer. Master bedroom leads to private deck. 130 sf loft with clerestory windows, built-in drawers and shelves plus “sea breeze” control is perfect for an office, children’s play area or guest room. Additional storage in closed off attic. Automatic water sprinklers and sensor lights.